The above sketch features in a drawing approved on 16th November 1973 to facilitate the installation of an Adastra Wild RC9 camera into the hatch area of the lower 41 electronics bay of Qantas Boeing 707-338C VH-EAA. Described in the drawing as a "mounting tray", it replaces the normal lower 41 inward-opening, plug-type hatch which was removed. It consists of a frame made from "good quality hardwood" covered with 0.10" thick steel plate which is, in turn, covered by 0.25" thick Alclad sheet. The underside of the tray conforms to the contours of the aircraft skin. 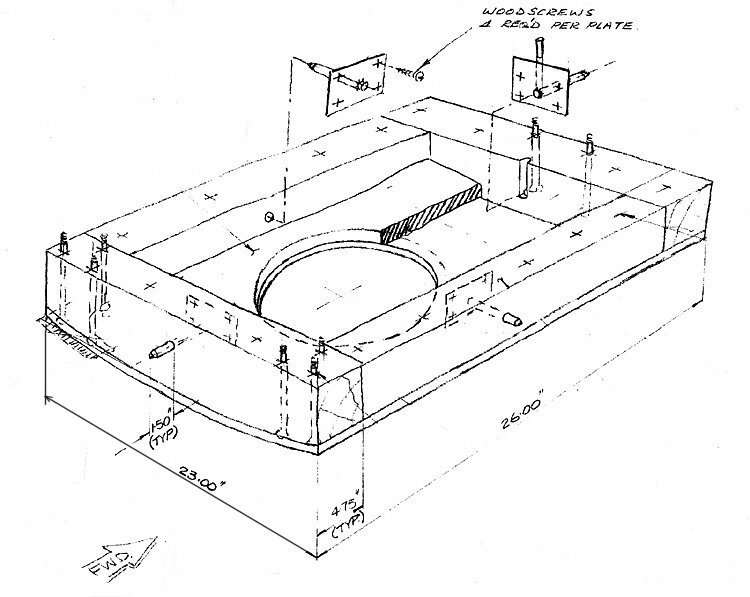 The tray is seated on a bed of sealant and is held in place by four pins which protrude through the wooden frame into existing holes in the frame of the hatch aperture. These pins are secured to the wooden frame of the tray with wood screws. The aircraft was flown pressurised, and although there is no glass in the camera window, the camera itself bore the pressurisation load on the opening.